Learn to set up a data science environment on Google Cloud: create an instance on Google Compute Engine, install Anaconda and run Jupyter notebooks! While AWS EC2 is the leader in cloud computing, Google Cloud has developed a very compelling and competitive Cloud Computing platform. Run Jupyter notebooks accessible online. Scalability: you can tailor the power (RAM, CPU, GPU) of your instance to your immediate needs. Starting with a small and cheap instance and adding memory, storage, CPUs or GPUs as your project evolves. Reproducibility: a key condition of any data science project. Allowing other data scientists to review your models and reproduce your research is a necessary condition of a successful implementation. By setting up a working environment on a virtual instance, you make sure your work can easily be shared, reproduced, and vetted by other team members. Although built around the same concepts and elements (instances, images and snapshots), EC2 and GCE differ on both access and resources organization. A key aspect of the Google Cloud Platform (GCP) is its project-centered organization. All billing, permissions, resources and settings are grouped within a user-defined project which basically acts as a global namespace. This not only simplifies the interconnected mapping of the resources you use (storage, databases, instances, ...) but also access management from role-based permissions to actual ssh keys and security. When it comes to user friendliness and access and role management, I find that working on the GCP is easier than working with AWS especially using multiple services. BigQuery a data warehouse solution that holds many fascinating Big Data datasets. A low learning curve and data friendly services make the GCP a must have in your data scientist toolbox. Before you start launching instances and installing Python packages, let's spend a few moments to review some of the common vocabulary used in Cloud Computing. A Virtual Machine (VM) also called "an instance" is an on-demand server that you activate as needed. The underlying hardware is shared among other users in a transparent way and as such becomes entirely virtual to you. You only choose a global geographic location of the instance hosted in one of Google's data center. A VM is defined by the type of persistent disk and the operating system (OS), such as Windows or Linux, it is built upon. The persistent disk is your virtual slice of hardware. An image is the physical combination of a persistent disk and the operating system. VM Images are often used to share and implement a particular configuration on multiple other VMs. Public images are the ones provided by Google with a choice of specific OS while private images are customized by users. A snapshot is a reflection of the content of a VM (disk, software, libraries, files) at a given time and is mostly used for instant backups. The main difference between snapshots and images is that snapshots are stored as diffs, relative to previous snapshots, while images are not. An image and a snapshot can both be used to define and activate a new VM. 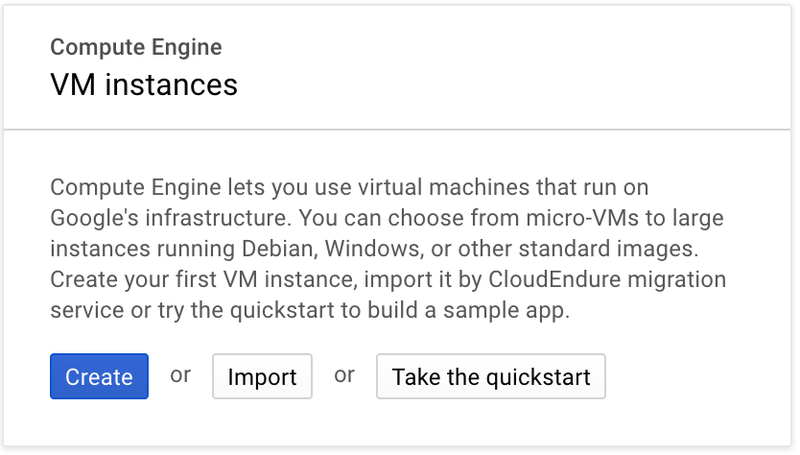 To recap, when you launch a new instance, GCE starts by attaching a persistent disk to your VM. This provides the disk space and gives the instance the root filesystem it requires to boot up. The disk installs the OS associated with the image you have chosen. By taking snapshots of an image, you create instant backups and you can copy data from existing VMs to launch new VMs. Let's put all of that in practice and get started with your first VM! To open an account on the GCP, you need a standard Google (Gmail) account. At time of writing, Google offers a 12 months / $300 free trial of the platform. Although this offer comes with certain restrictions (no bitcoin mining, for instance), it should be sufficient to get you started working in this environment. 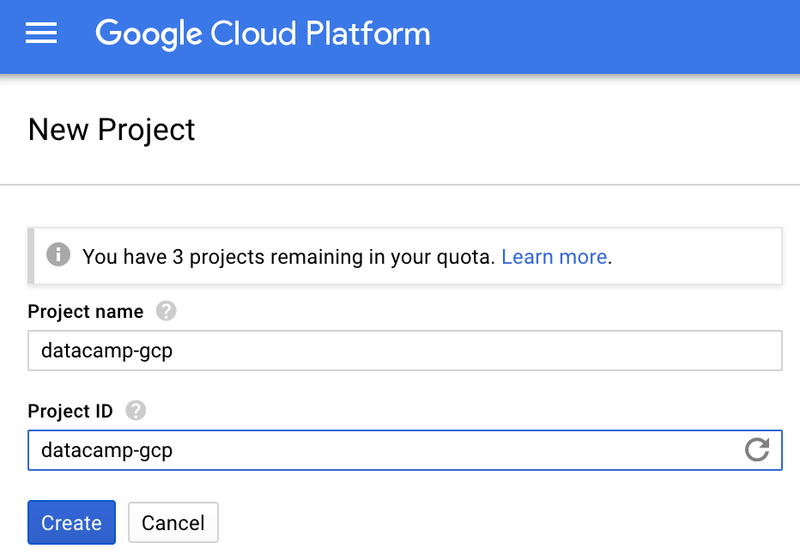 To create your GCP account with the free trial, go to cloud.google.com and click on the try it free button. You will be asked to login with your Google account and add your billing information. Once your account is created, you can access the web console at http://console.cloud.google.com/. You will first use the web console to define and launch a Debian-based instance and then switch to the web-based shell terminal to install all the necessary packages for your data science stack. Specify your project's title and notice how Google generates a project ID on the fly. Edit the project ID as needed and click on "Create". By default, when you create a new project, your Google account is set as the owner of the project with full permissions and access across all the project's resources and billing. In the roles section of the IAM page, you can add people with specific roles to your project. For the purpose of this tutorial, you will skip that part and keep you as the sole user and admin of the project. Go to your dashboard at https://console.cloud.google.com/home/dashboard and select the project that you just created. In the top left menu select "Compute Engine" and click on "VM instances". In the dialog, click on the "Create" button. You are now on the "Create an Instance" page. Name the instance: you can choose any name you want. I name my instance starling. Select the region: the rule of thumb is to select the cheapest region closest to you to minimize latency. I choose east-d. Note that prices vary significantly by region. Select the memory, storage and CPU you need. You can use one of several presets or customize your own instance. Here, I choose the default setup n1-standard-1 with 3.75 Gb RAM and 1vCPU for an estimated price of $24.67 per month. Select the boot disk and go with the default Debian GNU/Linux 9 (stretch) OS with 10 Gb. If you prefer using Ubuntu or any other linux distribution, click on the "Change" button and make the appropriate selection. Since Ubuntu is a close derivation of Debian, either distributions will work for this tutorial. 5.Make sure you can access the VM from the internet by allowing http and https traffic. 6. (Optional) Enable a persistent disk for backup purposes: Click on the "Management, Disks, networking, SSH keys" link. This displays a set of tabs, select the "Disks" tab and unselect the "Deletion Rule". This way, when you delete your instance, the disk will not be deleted and can be used later on to spin up a new instance. 7.Finally, click on "Create". Your instance will be ready in a few minutes. Notice the link "Equivalent command line" link below the Create button. This link shows the equivalent command line needed to create the same instance from scratch. This is a truly smart feature that facilitates learning the syntax of gcloud SDK. At this point, you have a running instance which is pretty much empty. There are 2 ways you can access the instance. Either by installing the gcloud SDK on your local machine or by using Google's Cloud Shell. Google's Cloud Shell is a stand alone terminal in your browser from which you can access and manage your resources. You activate the google shell by clicking the >\_ icon in the upper right part of the console page. The lower part of your browser becomes a shell terminal. This terminal runs on a f1-micro Google Compute Engine virtual machine with a Debian operating system and 5Gb storage. It is created on a per-user, per-session basis. It persists while your cloud shell session is active and is deleted after 20 minutes of inactivity. Since the associated disk is persistent across sessions, your content (files, configurations, ...) will be available from session to session. The cloud shell instance comes pre-installed with the gcloud SDK and vim. It is important to make the distinction between the Cloud shell instance, which is user-based, and the instance you just created. The instance underlying the cloud shell is just a convenient way to have a resource management environment and store your configurations on an ephemeral instance. The VM instance that you just created, named starling in the above example, is the instance where you want to install your data science environment. 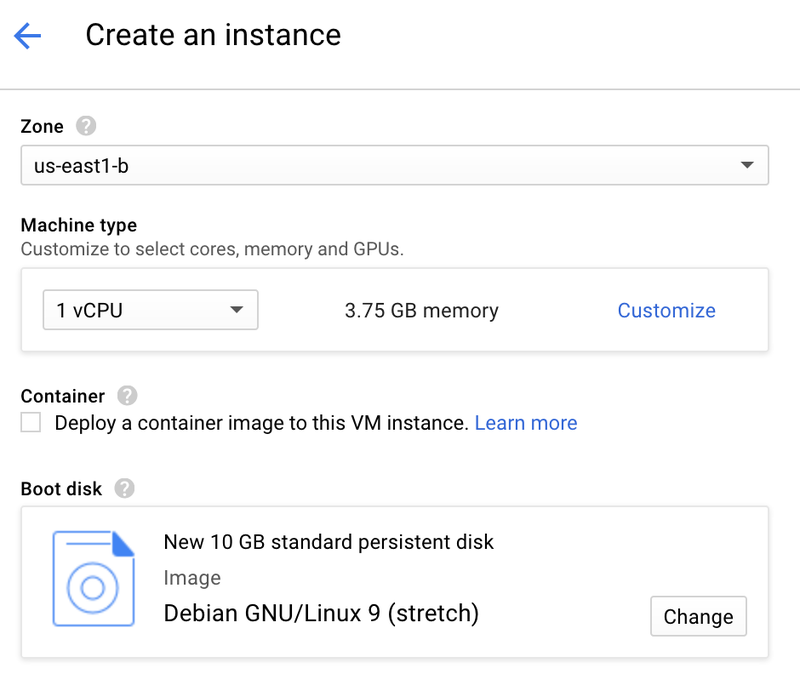 Instead of using the Google Cloud shell, you can also install the gcloud SDK on your local machine and manage everything from your local environment. Here are a few useful commands to manage your instances. Installing a few Debian packages with apt-get install. Installing the Anaconda or Miniconda distribution. Setting up the instance to make Jupyter notebooks securely accessible online. libxml2-dev, which is not required at this point but you will often need it when installing further Python libraries. Once the above packages are installed, turn your attention to installing the Anaconda distribution for Python 3. You have the choice between installing the full Anaconda version which includes many scientific Python libraries, some of which you may not actually need or installing the lighter Miniconda version which requires you to manually install the Jupyter libraries. The process is very similar in both cases. The install shell script is downloaded and run with the first 2 lines. You should accept the license and default location. In line 3, the no longer needed shell file is removed. Sourcing .bashrc on line 4, adds the conda command to your $PATH without having to open a new terminal. And finally, the last line installs the required python libraries: scikit-learn pandas jupyter ipython. You now have a working Python environment with the standard data science libraries installed (sklearn, pandas) . The third and final step is to configure your VM to allow web access to your Jupyter notebooks. and leave all the other variables to their default values. This firewall rule allows all incoming traffic (from all IPs) to hit the port 8888. Now go back to the VM page (top left menu > Compute Engine > VM instances), click on your VM name. Make a note of your VM IP address. This is the IP address that you will use in your browser to access your Jupyter environment. In my example, the IP address is: 35.196.81.49, yours will be different. Jupyter notebooks come with a configuration file that needs to be generated and edited in order to setup online access to your notebooks. In the terminal, run jupyter notebook --generate-config to generate the configuration file. And jupyter notebook password to generate a password. Tip: make sure that this is a strong password! (to switch to edit mode in vim, just type the i character). Quit and save with the following sequence ESC:wq. This will allow the notebook to be available for all IP addresses on your VM and not just the http://localhost:8888 URL you may be familiar with when working on your local machine. In your browser go to the URL: http://<your_VM_IP>:8888/ to access your newly operational Jupyter notebook. You are also currently running the server over http and not https which is not secure enough. Let’s Encrypt provides free SSL/TLS certificates and is the encryption solution recommended in the jupyter documentation. For more information on security issues related to running a public Jupyter notebook, read this. Jupyter notebooks are very convenient for online collaborative work. But you can also run an IPython session from your terminal simply with the ipython command. That will open an IPython session which has all the bells and whistles of a Jupyter notebook such as magic commands (%paste, %run, ...) but without the web interface. It's easy to set up your VM to be enable R notebooks in your Jupyter console. The instructions for enabling R Markdown are available from this great DataCamp tutorial: Jupyter And R Markdown: Notebooks With R by Karlijn Willems. Google Cloud offers many interesting services for data science and powerful yet easy to setup VM instances alongside a very attractive free trial offer. The web console is easy to navigate and often displays the command line equivalent to current configuration pages, thus lowering the barrier to using the gcloud SDK. In this article, you've learned how to select and launch a VM instance, install the necessary Debian packages, Anaconda distribution and data science stack and finally how to setup the access rules to launch a Jupyter notebook accessible from your browser. Although the whole process may seem a bit complex the first time, it will quickly become familiar as you create and launch more and more VMs. And in case things become a bit too muddled, you can always delete the VM you're working on and restart from scratch. That's one of the perks of working in the cloud. After a few times you will be able to spin up complete data science environments on Google Cloud in a few minutes. Feel free to reach out and share your comments and questions with me on twitter: @alexip.